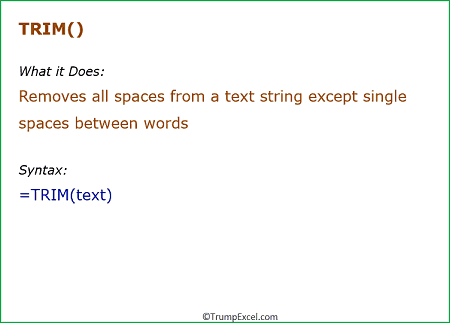 Excel TRIM Function is best suited for situations when you need to clean the dataset by removing leading, trailing, and double spaces. It returns the text string where all the leading, trailing, and double spaces have been removed. The best way to understand how useful Excel TRIM function can be would be to see it in action. Here are three practical examples of using the TRIM function. TRIM function is made to do this. Below is an example where there are leading, trailing, and double spaces in the cells. Copy paste this into all the cells and you are all set. In some cases, you may want to get rid of only the leading spaces and not the rest. For example, below I have a list of addresses where there is a double space between the different parts of the address (done to increase the readability). However, there are also some leading spaces (in row 2 and 4). If you use the TRIM function on this, it will remove the leading spaces, but it will also remove the double spaces that we have intentionally placed. MID(TRIM(A1),1,1) – This part of the formula will give you the first character of the address (after removing the leading spaces). For example, in the case of second address (3344 Better Street), there are leading spaces, but this formula would return 3. FIND(MID(TRIM(A1),1,1),A1) – This part of the formula would find the position of the first character in the address. For example, in the second address, 3 is in the third position (as there are two leading spaces before it). LEN(A1)-FIND(MID(TRIM(A1),1,1),A1)+1 – This part of the formula would give you the total length of the address after removing the leading spaces. =RIGHT(A1,LEN(A1)-FIND(MID(TRIM(A1),1,1),A1)+1) – This would give you the result where it extracts all the characters after the leading spaces. On similar lines, you can create formulas that can remove only the trailing, or only leading and trailing spaces from the text. Spaces in a text is also an indication of the word count in it. For example, if you want to count the total number of words in the phrase – “The quick brown fox jumps over the lazy dog”, you can simply count the spaces in between the words and add 1 to it. This formula substitutes all the spaces with blanks and then counts the number of spaces in the text and add 1 to it. However, when you have additional spaces in the text, this formula would not work. The TRIM part of the formula in this takes care of the additional spaces.